Building volunteers work in Cape Town in the townships of Lavender Hill, Grassy Park and Imizamo and are involved in helping to construct buildings for local orphanages and care centres in the communities we work with. 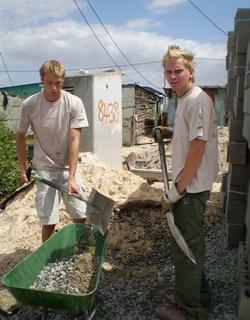 Volunteers work alongside the local workmen, assisting with all levels of building and construction. The buildings are made using an eco-bag system. Eco-bags are filled with sand, and using this technique it is possible to build better quality houses for less money, whilst also using ecological materials. The construction techniques are also simple to master and are ideal for sites with limited facilities. 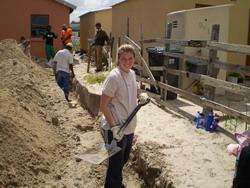 No electricity is required at the site and only minimal amounts of water and cement are necessary. Many of the placements we work with are housed in inadequate accommodation. The building project allows us to make big improvements, whether by building a new classroom for a kindergarten or a new bedroom at an orphanage. The roles that volunteers are involved in will vary but may include digging foundations, mixing cement, placing the eco-bags to build walls and rooms, building a roof, plastering or putting the finishing coat of paint on the completed house. Вы можете ознакомиться с детальной информацией о целях данного проекта здесь: South Africa Building Management Plan. The building work takes place early in the morning and late in the afternoon so you'll have plenty of time to get involved in township life. Each site is overseen by a qualified builder from the community who will help volunteers and homeowners with the construction process. You do not need previous building experience to take part in this project; although anyone who does have any relevant skills will be very welcome and will be able to take on a more specialised role. All volunteers should, however, be reasonably fit and physically active, and be prepared for working outdoors in a variety of weather conditions. This project is available for two weeks if you don't have time to join us for a month or more. This project has been selected by our local colleagues as being suitable for short term volunteering for both the host community and the volunteer. Although you will gain a valuable cultural insight and work intensely within the local community please be aware that you may not be able to make the same impact as someone volunteering for a longer period. The project is available all year round in Cape Town.